Everyone wave at Durex again! I'm thoroughly enjoying him right now! I wanted to push myself a little today, so we're featuring a couple of skins from Go&See. I find it kind of cute when couples in SL match, but also sort of don't so I'm hoping I'm pulling that off with this photo. One thing that means a lot to me in a picture is emotion, and another is telling a story. The story or the emotion can differ entirely depending on perspective, but whenever I take a picture, those are the things that are important. Things like eye-contact, touch, body-language are big players in this to me, maybe because of my RL situation right now I'm kind of missing some of these things, but I like to at least attempt to portray these in SL. It's kind of odd to me, because when you develop a relationship with someone in Secondlife, you're not really seeing any of these things from the offset. You have to express these things with your words... which I think is why I enjoy attempting to show relationships so much with the emotion we miss from our barbiedolls. Still, they are just barbiedolls, and there's no doubt for me about the importance of connecting beyond the mind too. Let's be good humans today, yeah? The Go&See Theo skin is available in the mainstore in Five tones. Shown here in CalWL on ultra, in firestorm viewer in the tone "Summer" which is around the mid-tone. Along with the no beard, beard and beard & freckles version shown here with eyebrows, there is the option of no eyebrows, no eyebrows & beard too. Theo has a catwa and omega applier for your mesh head, which means that omega capable head you own that isn't catwa will be able to support this skin. Just ensure you have the correct relay from the omega store to make it work wherever necessary. The body is also omega - making it suitable for Signature, Adam, Belleza and any other body with omega support. I wanted to give you a little more information on the Go&See * Emily Gacha * @ Whimsical . The skin is the rare and comes available in two packs. Pack two contains Goth, Pale, Tan and Tropic tones. Although shown in the photo I'm still using LOTUS : Intuition Eyes the Go&See gacha has 10 Catwa eye appliers and 8 lipsticks as commons to pull! 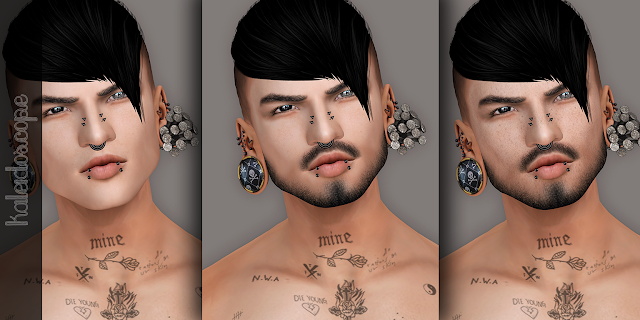 Also shown here are the :: SAGA :: Freja Lashes/CATWA available at the mainstore. There are FOUR packs, with TWO different lashes offered in each, and they all come with black and white (to tint, or not to tint!) options. They are only available for Catwa heads.